On April 22, the Delhi government announced the start of the Premium Bus Scheme by June 1 to strengthen the public transport system in the capital state. Under the scheme, people can book their seats in private buses through mobile apps. Three days later, Delhi Lieutenant Governor (LG)Najeeb Jung stalled the scheme, saying it will benefit only certain private companies. Jung’s office returned the file to the government saying the issue needs to be investigated. Despite the LG stay, on June 7, the Delhi government published advertisements on the benefits of the scheme in leading newspapers. The recent controversy has once again highlighted how politics and outdated laws come in the way of an effective public transport system. The logic behind such schemes is simple: to utilise private buses in the country that operate for not more than a few hours a day for schools and companies. Government data suggests that there are more than two million such buses in the country. But the execution is difficult. For starters, private bus owners can apply for two kinds of licences under the state Motor Vehicles Act (MVA)—contract carriages permit for plying within a city or stage carriage permit for plying intercity. The Act is silent on the issue of bus aggregators—a company that works as an intermediary between bus operators and users. “As of now, bus aggregators are operating in a grey area,” says R S Minhas, spokesperson and transport expert, Delhi Transport Corporation (DTC). The term bus aggregator has been recognised for the first time in the proposed Road Safety Bill, 2015, which was introduced in Parliament’s monsoon session last year. The Bill is now under consideration by a Group of Ministers, which is expected to submit its final report by July 2016. Section 2 of the Bill defines “aggregator” as including a digital intermediary or online marketplace for a passenger to connect with a driver for the purpose of transportation. While introducing the Bill, the Union government had also issued advisories to all the states for “licensing, compliance and liability of on-demand information technology-based transportation aggregator”. The Delhi government announced its Premium Bus Scheme on the basis of this advisory. Karnataka has also introduced a set of bus aggregation rules following the advisory. While the Delhi bus aggregation policy is stuck between the LG office and the state government, private aggregation companies, Ola and Uber, have moved Karnataka High Court against the state rules. They have challenged a clause in the rules that prohibits surge pricing—charging a premium during peak hours. Meanwhile, bus aggregation continues in an adhoc basis. “In the absence of a legal framework, we are at the mercy of the officials,” says Suchitra Singh of Shuttl, a bus aggregator in Delhi NCR. For example, in Bengaluru, bus aggregators are allowed only on routes where buses of state-owned Bengaluru Transport Authority do not ply. Almost all Indian cities are struggling with their public transport system. This can be seen in the remarkable number of private cars that are being sold today. According to the Union transport ministry, in 2015, about 88.27 million new vehicles were added to Delhi roads. Bengaluru added 6 million vehicles that year. It is here bus aggregation can help, primarily because it targets car-goers. The scheme announced by the Delhi government, for example, says only air-conditioned buses will be allowed and tickets need to be pre-booked through mobile apps. The scheme also has a provision of penalising bus operators on cancelling trips. “There is a very large and growing population of commuters who would rather not deal with the hassle of parking if a reliable daily commute is available,” says Anupam Mittal, an angel investor who has invested in Ola Shuttle in Mumbai. This scheme will attract such people because these buses will not be over-crowded and will be air-conditioned. Bus aggregators also say that the model has a lot of business potential. “The bus aggregation sector can grow bigger than the radio taxi service, which has an estimated market size of over Rs 60,000 crore,” says Mittal. No wonder, several private companies have already entered the sector. One such example is Shuttl, which has raised an investment worth US $3million within one year of its launch in April 2015. The app-based bus aggregator claims that it on an average arranges 15,000 rides a day. 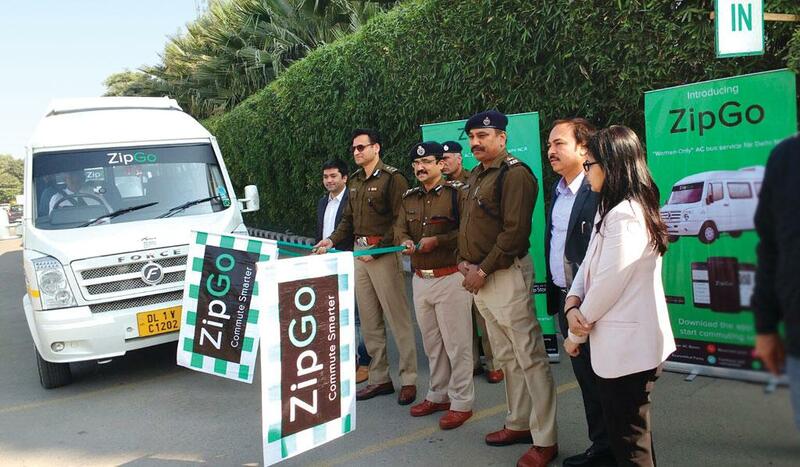 Similarly, Bengaluru-based ZipGo provides air-conditioned bus rides throug- hout the city for just Rs 29. Its app also gives real-time data on city traffic. One of the first bus aggregation services was started in Mumbai in 2015 by rBus. The company today covers 17 routes in Mumbai, and caters to over 500 commuters. Using its Android app, commuters can pick a route and timing for their travel. The company also provides services like Wi-Fi, app-enabled payments, live tracking of buses and flexible timings. It charges Rs 500 for 10 rides a week. The office of Delhi’s Lieutenant Governor rejected the Premium Bus Scheme over fears that it can lead to monopoly of the public transport sector. Speaking to Down To Earth, Gopal Rai, Delhi transport minister, says checks and balances are in place to avoid monopoly. “While they (bus owners) will decide their fares, the government would prescribe an upper limit and retain the option of taking steps to check predatory pricing.” Many also fear that private players can actually weaken the existing public transport system. Aggregators, however, refute the claim. “Bus aggregation is a premium service that works on a model of pre-booking,” says Minhas. Safety is another issue. The Delhi scheme says licences would be given only to bus operators who have at least 50 vehicles. The buses would have two CCTV cameras, WiFi and GPS. “In view of women’s safety, bus aggregators will also have to ensure panic button in their apps,” says Rai. Even the Road Safety Bill proposes the setting up of the National Transport Authority to make and monitor schemes pertaining to aggregators. “A proper legal framework will benefit both companies and customers,” says Singh. This article appeared in the 16-30 June, 2016 issue of the magazine.